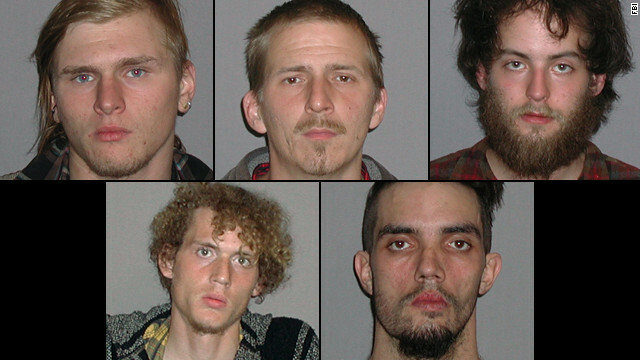 (CNN) — A mohawk-wearing anarchist nicknamed “Cyco” was among five men arrested after allegedly conspiring to blow up a bridge about 15 miles south of Cleveland, according to court documents released Tuesday. Douglas L. Wright, 26, joined alleged co-conspirators Brandon L. Baxter, 20, a.k.a. “Skabby,” and Anthony Hayne, 37, a.k.a. “Tony” and “Billy,” in a plot authorities say homed in on the Brecksville-Northfield High Level Bridge, which spans the Cuyahoga Valley National Park and carries a four-lane highway. The men were arrested Monday evening in an FBI sting, but posed no real danger to the public because the explosives they had were inert and were controlled by an undercover FBI employee, the bureau said in a news release. Connor C. Stevens, 20, and Joshua S. Stafford, 23, also were arrested, though their charges remain pending. “The defendants stand charged based not upon any words or beliefs they might espouse, but based upon their own plans and actions,” U.S. Attorney Steven Dettelbach said in a statement. They allegedly conspired to acquire plastic explosives (C-4) and build two bombs, affixing them to the bridge’s support columns to be remotely detonated on Monday. Wright, Baxter and a man referred to as C.S. allegedly agreed to pay $900 for the devices, as well as separate riot gear, according to a criminal complaint filed Tuesday in U.S. District Court. At first, they’d considered using smoke grenades to distract local law enforcement in an effort to “topple financial institution signs atop high rise buildings,” the complaint says. Wright allegedly was pursuing “The Anarchist Cookbook,” which describes the construction and use of explosives. “We can make smoke bombs, we can make plastic explosives. … It teaches you how to pick locks. It does everything,” he is alleged to have said. According to the complaint, authorities were first alerted to the beginnings of the alleged scheme last year when an undercover FBI employee attended a protest group’s event. The men were “constantly moving through the crowd expressing displeasure at the crowd’s unwillingness to act violently,” it says. During the course of the alleged plot, however, Baxter later expressed reservations, saying that blowing up a bridge “would not stop money flowing to the ‘one percent,'” the complaint says. The reference is catch-all phrase commonly employed by the Occupy movement in describing America’s wealthy, particularly those atop the financial services industry, suggesting they hold disproportionate influence over the rest of the country. “We continue to be committed to creating social change through non-violence,” the group said. Federal authorities say the year-long operation focused on the five suspects and had not targeted the broader Occupy movement. CNN National Security contributor Fran Townsend said she would expect no others to be named in the case. “Typically in the course of an investigation, you let that investigation run until you identify all those you believe pose a threat and then you wrap them all up at the same time,” she said. The men, whose attorneys could not be immediately reached for comment, were slated to appear before a federal magistrate in U.S. District court later Tuesday.